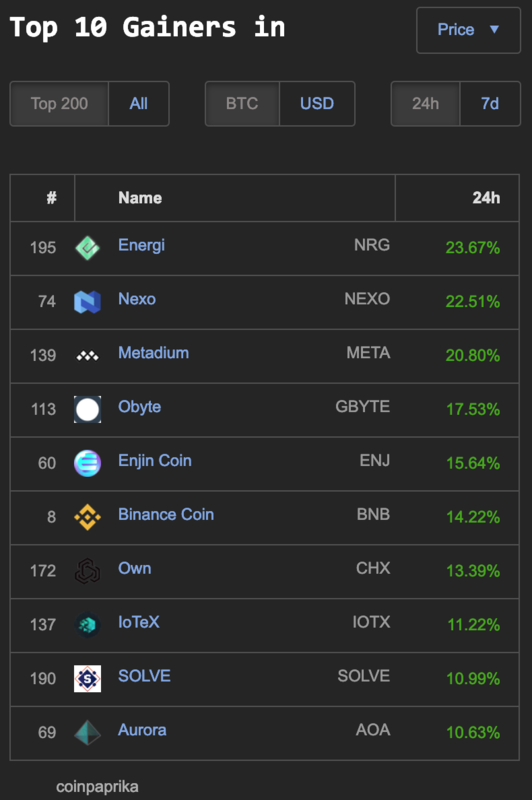 The top 100 in market cap on Coin360.io has seven coins gaining double digit percentages today: NEXO (20%), Enjin Coin (ENJ) 15%, Binance Coin (BNB) 14%, United Bitcoin (UBTC) 12%, Chainium (CHX) 12%, and NANO 10%. 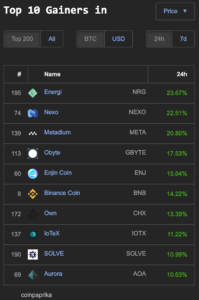 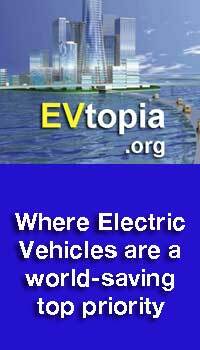 Within the top 200 market cap there are ten coins on Coinpaprika.com that have double digit percentage gains: Energy (NRG) 23%, NEXO, 22%, Metadium (META) 20%, Obyte (GBYTE) 17%, Enjin Coin (ENJ) 15%, Binance Coin (BNB) 14%, Own (CHX) 13%, IoTeX (IOTX) 11%, SOLVE 10% and Aurora (AOA) 10%. 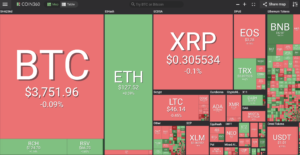 The top 200 coins in marketcap also have their share of double digit gainers today. 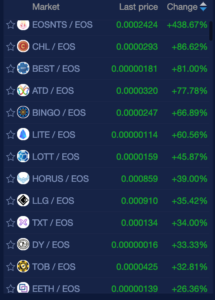 Continuing their 50+ day winning steak coins trading with EOS on NewDex.io are the largest percentage gainers in the cryptocurrency market of the day with one coin EOSNTS gaining 438% and 22 other coins with double digit percentage gains. 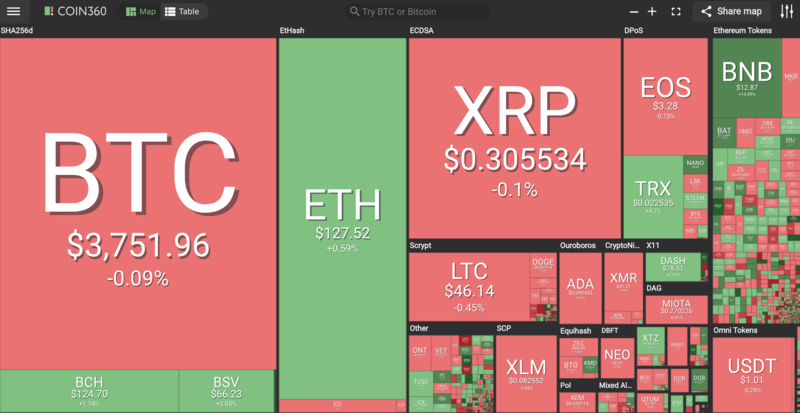 Some non-gambling standouts include: Challenge DApp CHL (86%), Atidium (ATD) 77%, LITE 60%, HORUS 39%, EETH 26%, EDNA 25%, SHARE 22%, PEOS 22%, DAB 16% and MORE 14%. 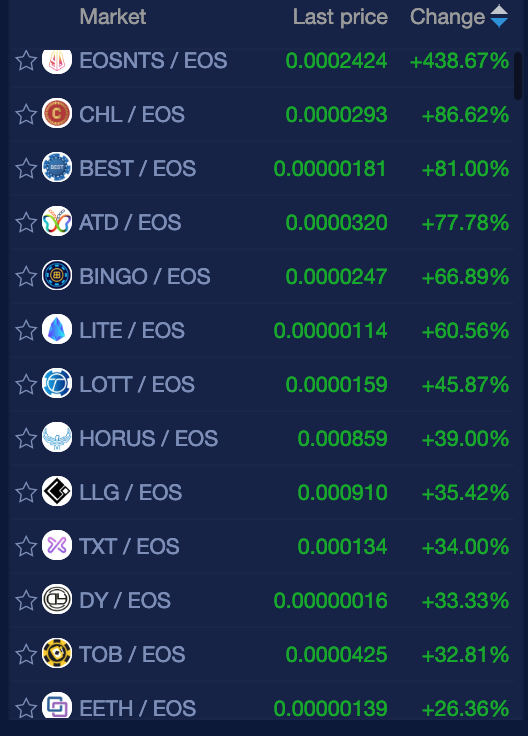 Different day–same story EOS tokens, coins and projects are by far the largest gainers.